A native of Oaxaca, guitarist and composer Gil Gutiérrez has made his home in the UNESCO World Heritage city of San Miguel de Allende, Mexico for many years. A guitar virtuoso, he has attracted a following throughout North and South America as well as Europe through his many CD’s, film scores, and concert appearances. 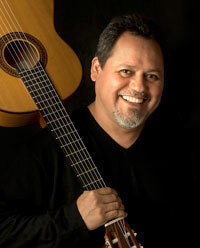 After studying classical guitar at the Benito Juarez Autonomous University in Oaxaca with teachers Jose Benitez from Peru and Jose Saldana of Mexico, Mr. Gutiérrez’ interests spread to many musical genres, such as classical, jazz, flamenco, son cubano, and he brings a unique sensitivity and excitement to the music. Mr. Gutiérrez has toured South America and Spain with Ana Gabriel, Ricardo Arjona, Francisco Cespedes, and Pedro Guerra, and composed music for such films as “El Cochero,” Una Causa Noble,” and “El Alcazar de Chapultepec.” He has performed at the Kennedy Center and the Mexican Cultural Institute of the Mexican Embassy in Washington D.C. Last year he performed his original compositions with the New York Choral Society in Oaxaca, San Miguel de Allende and Guanjuato, Mexico. Gil Gutiérrez has collaborated in more than 60 concerts with trumpeter Doc Severinsen, appearing with symphony orchestras across the United States and recently at the International Trumpet Festival with Arturo Sandoval in Mexico City. While you might not recognize the name, you would instantly identify the violin artistry of Charlie Bisharat. His work has graced the albums of such pop phenoms as Alanis Morissette, The Rolling Stones, Jane’s Addiction, and Aerosmith. His diversity can be heard on the works of Jazz and World Music artists Strunz & Farah, Don Grusin, and Oscar Castro-Neves. And his accomplishments have been featured in scores of soundtracks from Swordfish, Texas Rangers, Steal Big Steal Little to on-screen performances of Austin Powers Gold Member, The Drew Carey Show and Friends. A Grammy Award-winning performer, Mr. Bisharat has toured the world time and again with Jazz and New Age groups as varied as Shadowfax, Kitaro, Yanni and John Tesh. He has composed and produced tracks for record-setting album projects as well. His range of styles has led him from pop to jazz to classical, where he is often heard subbing with the Los Angeles Philharmonic Orchestra and the Los Angeles Chamber Orchestra. His wide array of skills is best exemplified on his own recording on Universal Music Group’s Along The Amazon, an all-star album featuring some of jazz and pop’s greatest artists. His latest collaboration is with the acclaimed Al-Andalus Ensemble, having released the evocative CD 21Strings in 2009. The group travels the globe presenting concerts and promoting Middle East culture and the arts. A published author as well, Charlie has written and recorded the jazz improvisational book and CD Beyond Classical Violin for Cherry Lane Music. Mr. Bisharat’s compositions have been featured in movies and television as well as a myriad of recording projects. His works for small ensembles range from the original opus Lying In Wait which appears on the album Subliminal Blues And Greens by the all-female quartet Cello, to string arrangements for rock guitarist Andy Summers of The Police. Charlie continues to travel the globe performing in concert and recording with some of the most accomplished musicians of our day. Live appearances this year alone have included Costa Rica, Spain, Abu Dhabi, Jordan, Switzerland & Brazil. Born and raised in Los Angeles, Mr. Bisharat is in demand as one of Southern California’s busiest violinists. Television and feature film scores make up a generous portion of his recording schedule in town. In addition, he has appeared as a guest speaker at the Henry Mancini Institute and often lends a hand with the Yamaha Music Education programs both in the U.S. and abroad. 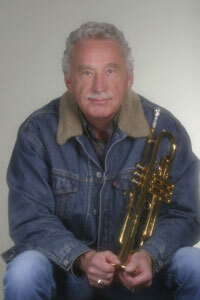 Jimmy Branly was born in Havana, Cuba and grew up in a rich musical environment of Cuban flavors. He began his studies at the Conservatory of Music in Havana Adolfo Guzman and ENA (National School of Art). At the young age of 9, his father introduced him to rock music including the band, Deep Purple. It was Deep Purple’s 1972 album “Made in Japan” that captivated Jimmy and drew him into the world of music. Being introduced to this style of music was of special import since Rock was not a significant genre in Cuba. Jimmy was also exposed to other rock groups like Rush, Led Zeppelin, and the Beatles building upon Jimmy’s desire to transcribe these artists. He expanded his interests when he began listening to jazz greats like John Coltrane, Elvin Jones, Chick Corea, and Keith Jarrett to name a few. Jimmy’s professional career began at the young age of 15 where he met Hernan Lopez-Nussa from the Afro-Cuban jazz septet “Afrocuba” who could hear that Jimmy was someone he wanted to play with. Jimmy started playing with the original band “Cuarto Espacio” that combined the styles of fusion, rock, and Cuban music. Jimmy actually didn’t start playing Cuban music in Cuba until 1996 with Issac Delgado. From there, Jimmy moved to NG La Banda. Jimmy continued to evolve in his approach to playing the drums when he worked with Gonzalo Rubalcaba who taught him to play with the more sensitive range of the instrument. Jimmy decided to move to California after being exposed to the rich range of social and musical opportunities that the United States has to offer. Carol Welsman I Like Men: Reflections of Miss Peggy Lee: 2009: drummer, percussionist, engineer, producer. Laura Harrison Now….Here: 2010: drums, percussionist, mixing engineer and co- producer. Otmaro Ruiz: Sojourn: 2008: drummer, percussionist, mixing engineer. Rebeca Mauleón: Descarga en California: 2006: drums, mixing engineer. Sandro Albert: The Color of Things: 2005: drums. Strunz and Farah: Fantaseo: 2009: drums and percussionist. Gonzalo Rubalcaba, Chucho Valdez, Emiliano Salvador, NG la Banda, Issac Delgado, Cuarto Espacio, Ernan Lopez Nussa quartet, Flora Purim and Airto Moreira, Michael Nesmith,Tony Perez, Strunz and Farah, Celia Cruz, Tito Nieves, Franky Negron, Sheila E, Jimmy Haslip, Russell Ferrante, Otmaro Ruiz, Riahnnon, The Carlos Cuevas Trio, Rebeca Mauleón, Francisco Aguabella, Poncho Sanchez, Luis Conte, Justo Almario, Brandon Fields, Mike Turre, Alex Acuña, Gregg Bissonette, Marvin “Smitty” Smith, Susie Hansen, Alan Pasqua, Brian Lynch quartet, Andy Narell, Andy Garcia, David Carpenter, Brian Bromberg, Emil Richards, Harry Shearer, Judith Owen, Doc Severinsen, Pat Senatore, Jazz on the Latin Side All Stars, Jimmy Johnson, Carol Welsman, Oscar Cartaya, Sandro Albert’s, Kellye Gray, Luis Conte, Michito Sanchez ,David valentin,Bob Sheppard, John Pissano, John Patitucci, Josvany Terry, Joe Gian, Victor Bailey, Renato Neto, Morrie Louden group, Adonis Puentes, Ricardo Silveira, Lou Forestieri, Theo Saunders, Billy Childs, Kellye Gray, Don Grusin, Omar Sosa, John Proulx, Ken Peplowski, Tom Scott, and many others. After working and studying his way through Colorado and Las Vegas, Kevin Thomas is establishing himself among the creative forces of the renaissance of jazz in Brooklyn. Comfortable in a wide variety of musical settings, his diverse performance credits range from Mickey Rooney and Don Rickles to Luciano Pavarotti and Andrea Bocelli to Stefan Karlsson and Don Menza. When he is not touring with Doc Severinsen and the San Miguel 5, Kevin’s performance and compositional efforts can be heard as both a leader and sideman in local clubs as well as on recent recordings by Chris Parrello, Nancy Danino, and Rachel Eckroth.